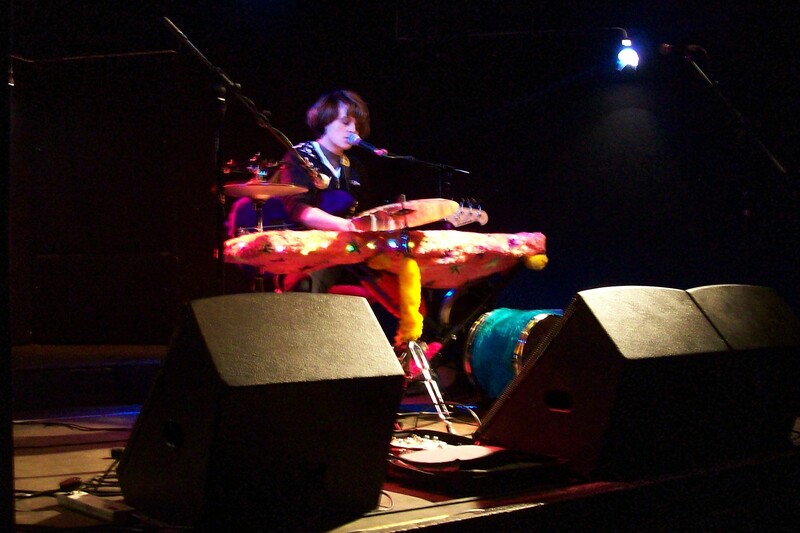 open mic – Poet on page and stage. 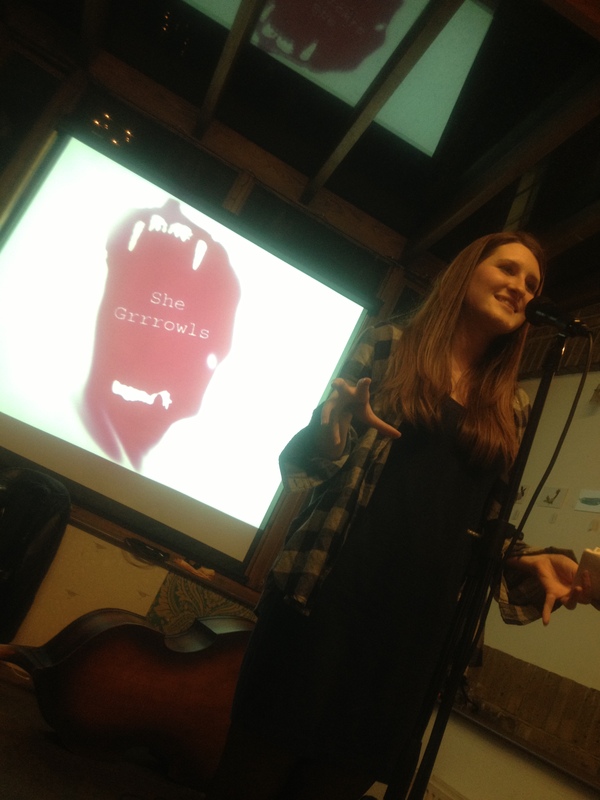 Creator of She Grrrowls. Facilitator. Writer. 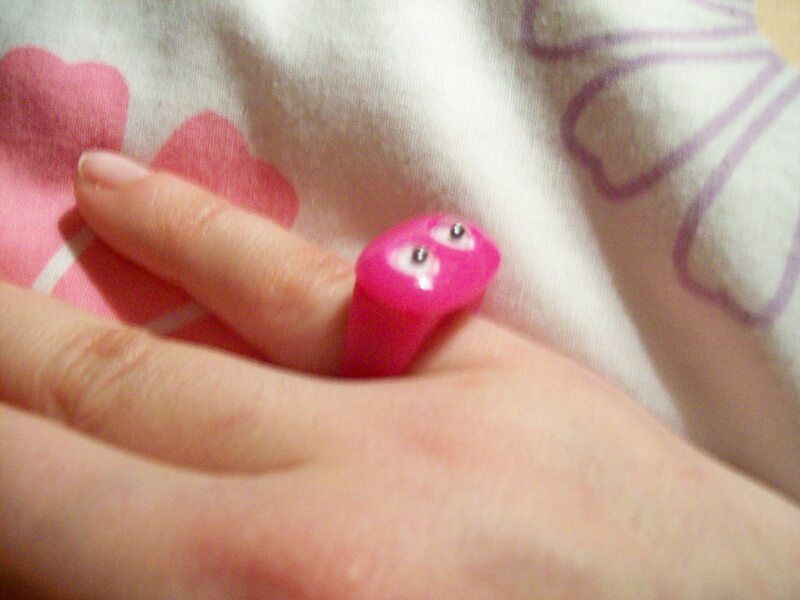 Last week I saw my friend Siobhan Belingy for her birthday and she gave me this cool pink ring – it’s eyes move! I also saw Grayson Perry’s exhibition at The British Museum and loved it! My Gran and Siobhan had both said it was unmissable so I’m really glad I got to see it. I loved the mix of old and new, Perry’s unique style (with the use of some of my favourite colours) and the use of text and poetry. It also dealt with really interesting subject matters, and I’d really recommend it. There’s a picture of the bike outside with my boyfriend Matt. We also went to the East London Design Show (good but we had to pay to get in?!) 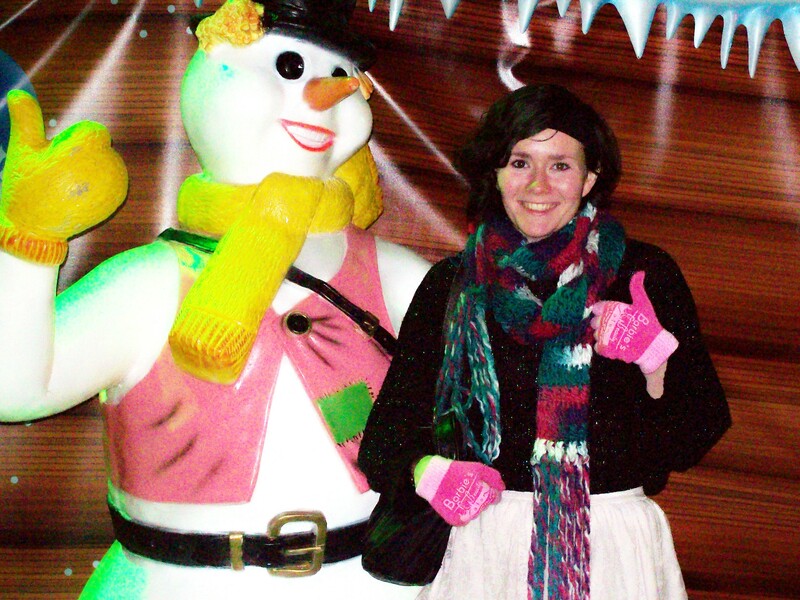 and Winter Wonderland which was lovely but neither me or my boyfriend could afford even a bag of candy floss! 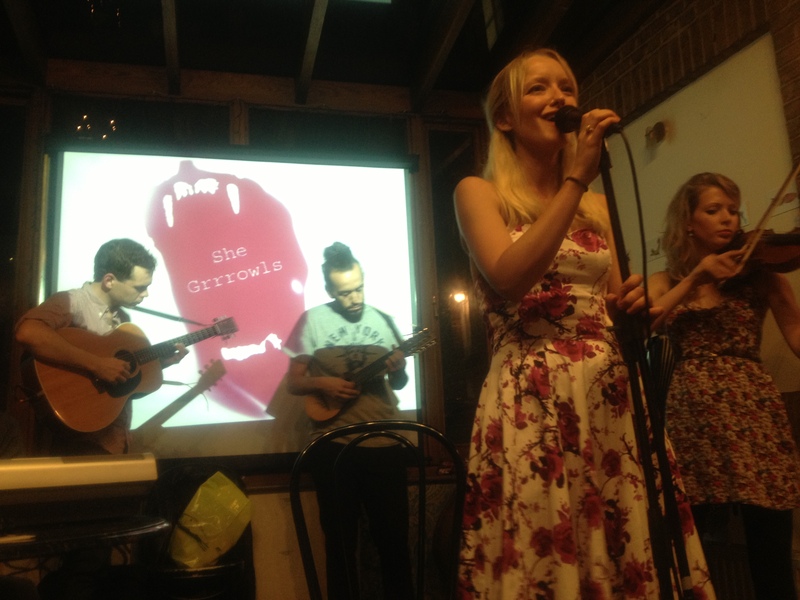 Lastly, on Tuesday I went to my last open mic night for some time at Herne Hill’s Half Moon pub for Needle & Thread. 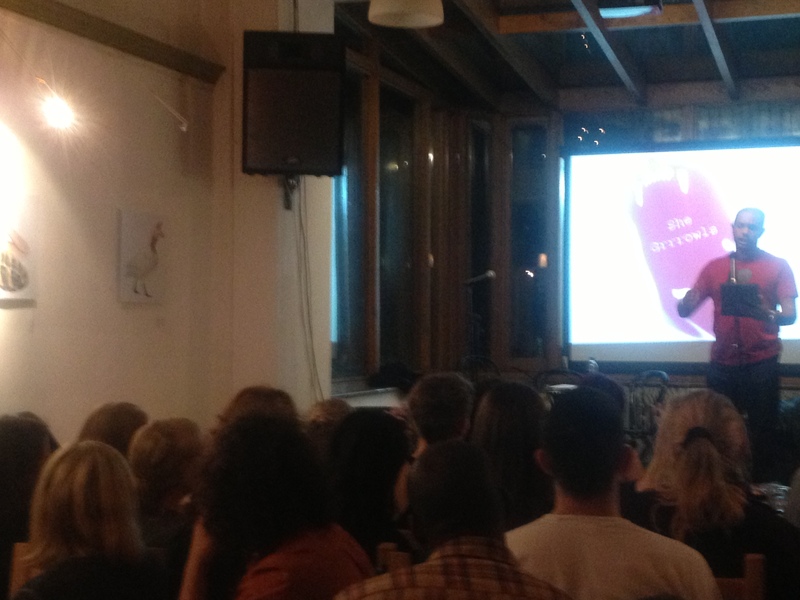 I did some new material but stumbled quite a lot so wasn’t the best gig. I’m now going into hiatus for a bit to concentrate on my MA work as the essays have been stressing me out. I’ve got a few things in the pipe-line (I met up with another poet this night to discuss future event plans) but I’m not going to hit the open mic nights regularly until at least around May. Also, Angel from Big Brother was performing at this open mic! I don’t know if anyone else knew who she was but I’ve watched every year of Big Brother so I found it rather exciting! Me and Matt have been flyering and getting organised with that but him mum reckons we should be charging for them. We’ve actually learnt a lot from doing it but it would be great if anyone knew how to get different shops selling them! We could have made about £90-390 from them! Monday I did the open mic and my friend Laura came along with me which was nice. The theme was ‘detox’ and we were encouraged to show the “new you” so I did all new material, including one about my new haircut, whilst wearing a new dress, just £2 from primark! However I didn’t get any of the prize potatoes, so had to ask for some at the end as I do love potatoes! A couple of girls came up to me and said how much they liked my set and said how they felt the words I spoke, which was great to hear because of it being new material, and that’s kind of the aim of what I do. I want people to understand and feel what I feel, like when you hear songs that just speak to you. There were all the usual performers really, apart from one girl at the start who was good but brought one REALLY irritating and, quite frankly, rude friend. She was constantly texting, eating, talking, laughing and had her back to the performers all night. I thought maybe she was going out after and just there for pre-drinks because her friends were there, but I noticed her change from heels to flats. It was just weird, I couldn’t help thinking WHY IS SHE HERE?! John Simpson Wedge was doing a ‘feature’ set and it was the best he’d ever performed. There was a lot of variety, as he ventured away from the comedy and did an amazing serious prose piece, and then a Coolio parody which was funny. Me and Laura ended up accidentally going out and went to Havana’s. It was fun but I didn’t want to drink as much as I did. It was good to meet some guys from The Birdcage but on the dance floor I was astounded at the disgusting behaviour from men in there. There was a big group of guys that just dominated an area and it just felt really unpleasant and predatory. At one point two of them came up to me and started to try to “dance” with me from in front and behind and I was creeped out and got them to move away, or rather, I just moved away. There were a group of scary guys that kept asking for a dance and then when we said no, they asked if we spoke English, and also asked if we would dance with their uncle, who was an elderly, short man. They followed us when we moved away, another guy even tried to keep one away from us. They attempted to touch Laura from behind and I told them to back off. Later, we saw they were leaving and glad, they walked past as and one pinched my bum so I pushed him away and felt incredibly angry. He turned to me in a threatening manner and I shouted not to touch me. They left but it ruined the night a bit and we decided to leave and got chips. We talked whilst waiting for the bus but didn’t get home until 4.30am. So I was pretty tired the next day! Anyway, that’s about it. DJ set at The Birdcage tomorrow with Kristy and our laptops haha. Just came back from the last UEA CWS open mic of the year. I’m on a certain antibiotic at the moment which is supposed to give you an insane headache if you drink alcohol on it so I spent 60p on two pints of blackcurrant squash. Seeing as I’ve already spent nearly all my money on Christmas presents, this no drinking thing is probably for the best. I’ve been going to alcohol counselling in an attempt to stop binge drinking and develop a healthier relationship with alcohol so it was interesting when I went to the last LitSoc social sober. The pub crawl part was actually really fun, and I think I made the most effort of anyone with the two members (who weren’t the committee or friends of the committee) that showed up. The club was where it went downhill. I hadn’t heard good things about the change from Po Na Na’s to Lola Lo’s but I went in with an open mind. Sadly, I couldn’t take advantage of the free vodka, and the mince pies never turned up. From then on, I felt like I was waiting for people to get drunk, and couldn’t really talk as the music was so loud. Eventually some of us danced for a bit, but then the others got fed up and I left early with a few people. It was around 1am so I felt that was an okay time, considering I still had lots of coursework to do! Anyway, back to tonight. I felt more nervous as I don’t think I have done a gig without a little dutch courage for over a year at Starbucks (they don’t do alcohol). Anyway, I felt like it went well and got a couple of compliments, not only on my poetry but also my outfit – Reko dress, white tights, vintage shoes and a Father Christmas hat. I got to speak to Leo Hunt who I remember liking the last time, and he’s a nice chap. I also remembered how much I adore Greta Healey’s voice; again, I think my Words & Music lecturer would like it. Anyway, I read a new poem called I Am No Better which was inspired by events at Hop Farm Festival last year, including a drunken vision of Kaya Scodelario (Effie from Skins), so it has been a long time coming, but hopefully that means it’s a gooden. I then dedicated my poem Passing Time, to a guy I’ve been acquainted with for a couple of weeks who said he’d never go to see poetry. I then did Drama as I was reminded of it whilst doing research for my Children’s Literature module. I finished on Tick the Box, which another performer told me they liked best. So, I was happy. On top of that, I won a chocolate prize for my attempt at the fancy dress! As the only effort was the hat, I’m pretty pleased… though am not sure I should be as the rest was just a normal outfit! Oh well, chocolate, can’t complain! I really enjoyed Christopher Ogden’s prose piece and think I prefer it to his poetry, which is unusual as it is more difficult to keep the audience’s attention with prose. Angela Robinson was really enjoyable again, and I find her work very cinematic, in an American way, but in a positive way that makes you want to take a trip! Chris Gray was next and his set was really funny, and delivered with confidence. Catherine Woodward is someone who impresses me more and more each time I see her, and is published so hopefully would be able to get her for a pure LitSoc event if we end up doing that. Robyn Comfort did a nice mix of poetry and song to acoustic guitar, including one about her boyfriend which was sweet; it reminded me of when I read at the Poetry Cafe and dedicated a poem to my boyfriend at the time, and how in that moment I made his heart feel more for me than he ever has since. Amy Wragg didn’t turn up, which I was disappointed about as I was looking forward to hearing her read. 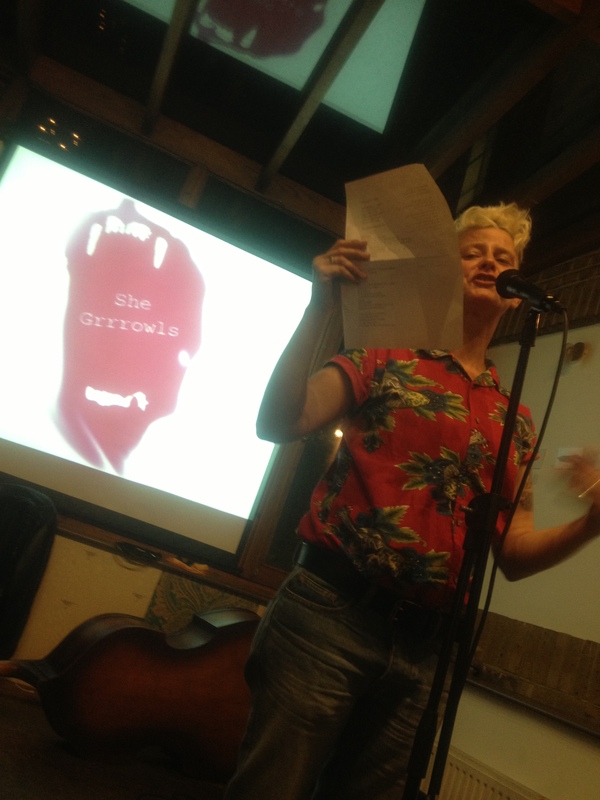 Laurie Eaves was as good as ever, and even worked a reference to one of Angela’s poems in his. Josephine Lister was headliner, and I’m still working out what I think about her poetry, as she’s quite loud and so maybe she should have more variation or something, I can’t put my finger on it, that said, I loved her poem The Way You Look Tonight. I also think I might fancy her just a bit. I’m really wanting to break open my chocolate snowman, but I’ve already had a massive Homemade Quorn Cottage Pie that should really serve two, and a strip of Cadbury’s Dairy Milk. I should also go to bed now as I still have essays to edit and expand upon (UNDER the word limit!) I also need to draw and scan in illustrations for my creative project for Children’s Literature. Then once that’s over, time to start on my Creative Entrepreneurship MA application and reading for my dissertation. You were Father Christmas in the nativity. I was a snow flake. Would you have pulled my hair? Would you have known my name? would you have been my aim in kiss chase? and standing on one leg in hopscotch? Would you save me if I was stuck in the mud? Find a plaster for my grazed knees? for pushing me too hard? You, eating Christmas dinner in the hall. Would I be on pack lunch at this time? ‘Cause I always changed my mind. or comment on my hairy legs? Would we keep in contact? Would we camp together at music festivals? would they call me their baby? Bite nails and smoke cigarettes? And experience what went on behind bike sheds? Because in reality I stopped riding bikes at secondary school. Or have someone to share the cakes with? Would we swap presents every year? or just play hangman at the back of the classroom? but always say see you soon. Would you ride off with reindeer to the moon? And dust me off your shoulder. Would you see life without me is colder? I enjoyed the last fundraiser for LadyFest Ten so much I decided to go again to this one. I was worried the tube strike would force me to take buses and get lost as I have a habit of travelling in the wrong direction. 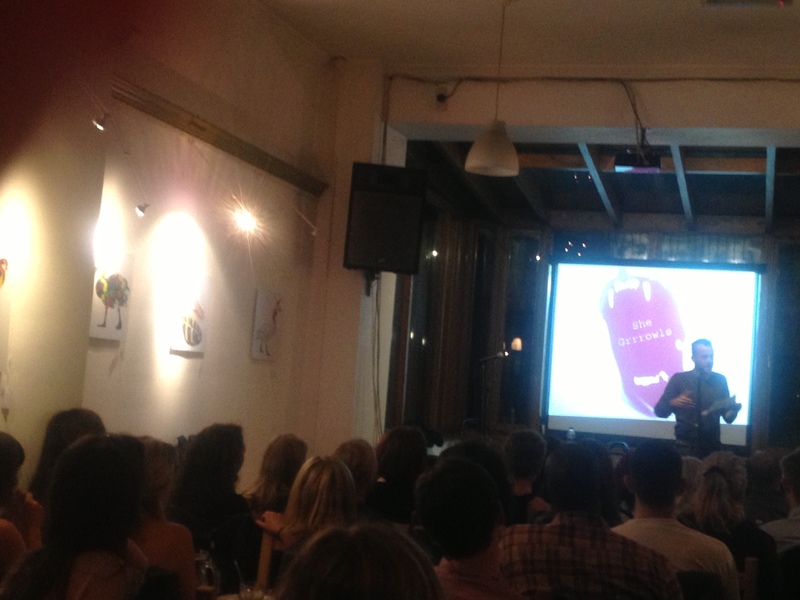 Since I came all the way from South West London to Mile End, there was really no excuse for anyone not attending! I think it’s more the idea that there will be problems travelling that stopped them coming, rather than any real obstacles. I was with my friend Elliot again as he lives walking distance, and we sat in the same place as before; I’m a creature of habit. We were given Poetry Bingo cards and edible DIY-poetry biscuits which we made with icing sugar glue. I thought that was really fun! The other acts this time weren’t as impressive and it wasn’t really as good as the time before, if I’m honest. The performers that stood out for me were Sophia Blackwell, of course, and Elliot’s friend Aurélie Jestin who played guitar and sang – I didn’t understand what she was saying as it was in French but I loved everything else you can like about music with lyrics you don’t understand. My own performance, I wasn’t that happy with… I don’t know, I just wasn’t feeling it. I had to bend to the mic a bit as it wasn’t positioned right, which is wierd as I’m quite short… and I messed up a few lines. Aurélie and Elliot liked it and the audience did make some ‘woo’ noises so I suppose I should stop being so miserable and just be pleased haha. However…there was this group of girls that wouldn’t stop talking throughout my set, and Sophia Blackwell… in fact, everyone! They seemed like such posers, all like “we’re at a feminist event! We’re lesbians/bisexual/friends with lesbians! We’re at a poetry event! We’re so cool!” It was just like, why are you here if you’re going to talk throughout the whole thing? I get really annoyed at people like that, it’s just plain rude! I wouldn’t make those statements about them normally, but that’s just the impression I got from their ignorance of attending something like this and not bloody paying attention! Well, rant over, that’s pretty much all I have to say. I’m deliberating whether to go to an open mic night next week… and if so, which to go to? It’s between Farrago and Spoonful of Poison. Farrago costs £5 which is a big factor really, since my main reason for wanting to go is out of obligation as I said I’d try to go to one before I go back to uni in Norwich. Spoonful of Poison I said I’d go to a couple of weeks ago but forgot and double booked, so feel a pull to go to that as well, but this one is also FREE to go to, so that would be good. 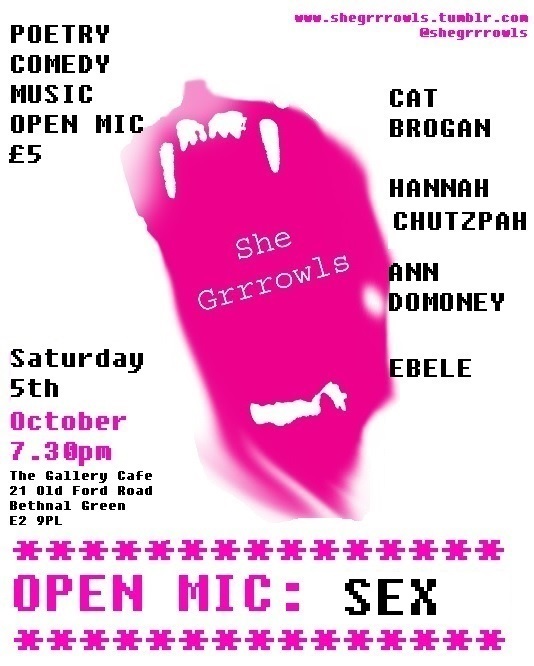 I’m also hoping to see my friend Natalie on that date and she would probably prefer Spoonful as it’s free and she even did her first poetry reading there. Dilemmasss! Any advice about that would be welcome, but I’ll probably end up going to whatever Natalie wants to go to… hopefully she will actually be back from Greece by then. 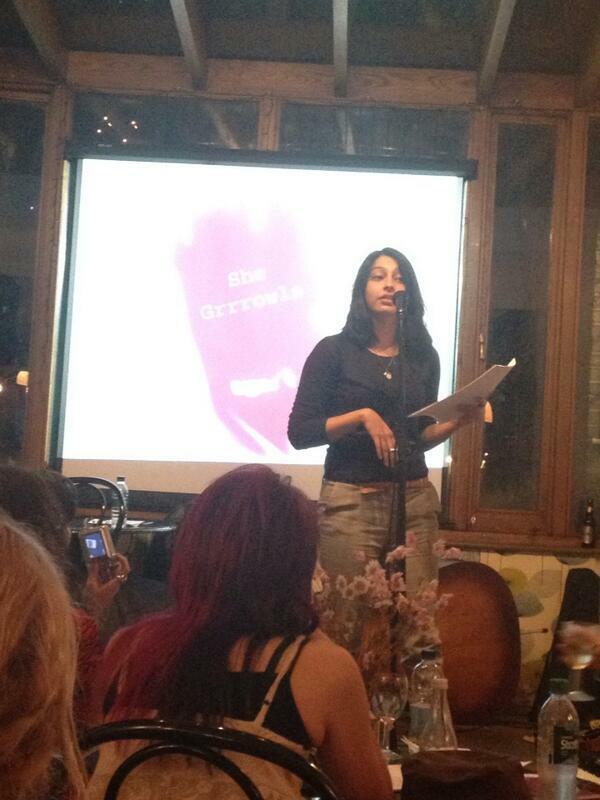 Last night I went to an open mic in Brixton’s Queen’s Head. It was quite at first and I arrived an hour early so sat at a lamp with Proust and a glass of wine. Rachel Pantechnicon was the featue who I’d seen a few times before at Farrago but had’nt spoken until this time, and I also recognised one of the open mic acts. I felt a bit embarrassed when I got off the stage after performing ‘Cinderella’ to press record again on my camera, and the microphone kept swinging away from me. Other than that, the audience were really supportive and seemed to like it. I really enjoyed it anyway and smiled throughout it. The video I recorded did cut off my head though.